The Modification takes about 10 minutes. 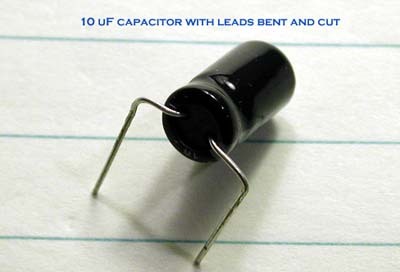 It uses one 10uF electrolytic capacitor and two solder connections. A photo tutorial of the mod follows. It is easy and fun to do and will permit your set to function better. The first step is to remove the top cabinet of the radio and remove the fast-on connectors for the speaker so that you can place the top case aside. The first photo shows the radio with the case off and the area where you will be working. The second photo identifies the variable pot for adjusting the meter. 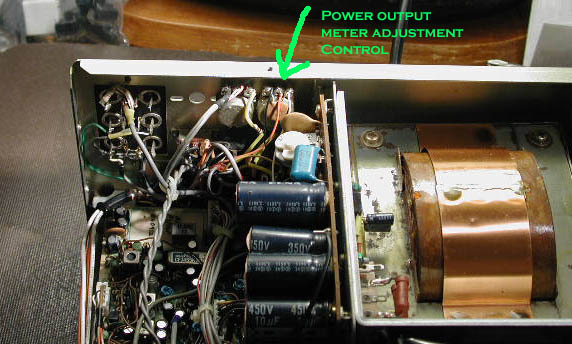 This pot does not have to be adjusted but you will have to solder the capacitor onto its outer terminals. The photo identifies the ground (yellow) and hot (pink) leads. The middle post is the wiper arm and is not involved in the modification. I used a radial lead 10uF capacitor (both leads come out the same end). The voltage limitation is not very important because it is in a low voltage circuit. As can be seen in this photo the leads are bent 90 degrees in opposite directions so that the cap looks like a ballerina doing a split. 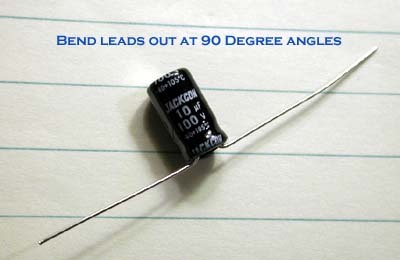 The fourth photo shows that the leads are bent again at 90 degrees so that they face in the same direction and are parallel and 1/2 of an inch apart. This will match up with the terminals on the control. The leads are also trimmed to about 3/4 of an inch in length from the bend to its far end. Again see photo #4. 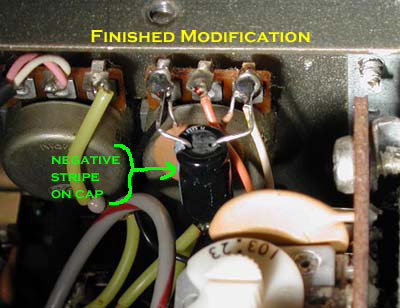 The stripe on the capacitor indicates the negative terminal and so you solder this to the left lead as indicated in the photo. 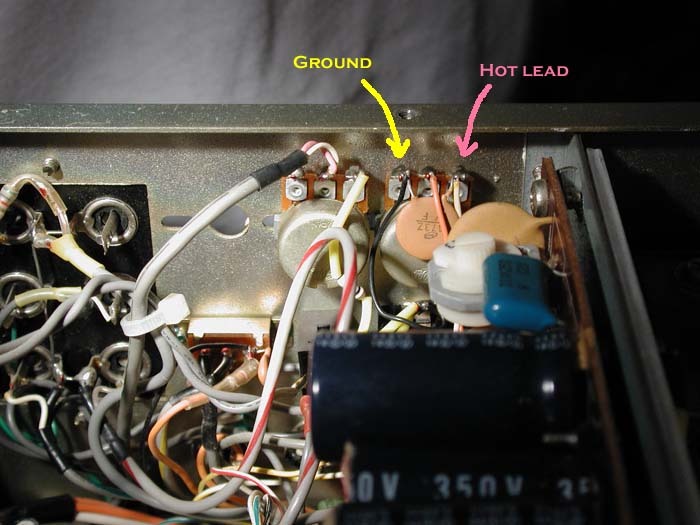 The positive lead is soldered to the right post and that is it. When you bend the leads note where the negative stripe is and the orientation of how you will place the cap into position. If you have done the second bend in the wrong direction, just rebend the leads. It should look like the final photo. Hams are by nature resourceful and industrious so that if you have an axial lead capacitor at hand (one lead comes out of each end of the cap) just apply your intelligence and skill to complete the job. Now button up the radio and note the increased responsiveness of the meter. If you want more movement ---- you guessed it - use a larger capacitor, but it should be an electrolytic and polarized. That's it folks. Have fun. I hope to have more mods in the future.